If your hot-weather workout makes you feel like you are burning more fat, that’s because you are. Although colder temperatures might make it seem like your body needs to work harder to warm itself, your body actually burns more energy in the heat. Working out in the heat comes with a bigger fat burn, but it also comes with several dangers. Working out in hot temperature burns more fat -- and calories -- because your body has to work harder to cool itself. Your body releases heat through sweat, which comes from blood pumped to your skin. The hotter your body gets, the more blood your heart needs to pump to expel that heat. Thus your heart works harder in hotter temperatures than it would in cooler temperatures, providing an increased calorie and fat burn. A 2002 study published “Medicine and Science in Sports and Exercise” examined the effects of different ambient temperatures on 90-minute cycling workouts of nine men, proving colder temperatures led to decreased fat burn. A 1997 study in the same periodical examined temperature’s effect on the length of a workout. Eight men cycled to exhaustion in various temperatures, with the lengthiest workouts performed in moderate to warm temperatures. Although hot temperatures burn the most fat, they can also cut your workout short. As evidenced in the 1997 study, cyclists who were able to withstand the longest workouts were those exercising in moderate to warm – not hot – weather. Hot temperatures can also be dangerous, leading to heat exhaustion and dehydration unless you are prepared and know when to stop. Warning signs include dizziness, sudden fatigue and nausea as well as leg cramps from depleted electrolytes. Drink plenty of fluids during a hot-weather workout. Water replenishes your body’s water content and a sports beverage can replenish your lost electrolytes. Be especially careful if heat comes with high humidity, a perfect combination for heat exhaustion. Wear lightweight, breathable fabrics that wick moisture away from your body and let you sweat freely . ACE Fitness: Do I Burn More Calories When It is Hot Outside? 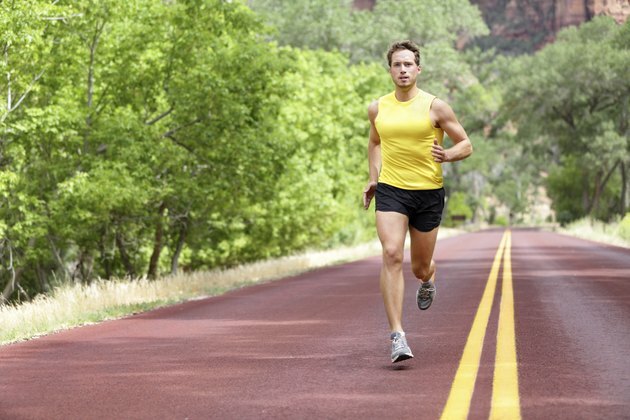 HeathMad: Do You Burn More Calories Working out in Hot Weather?